Brown, also known as seal brown, is one of the foundation colors. 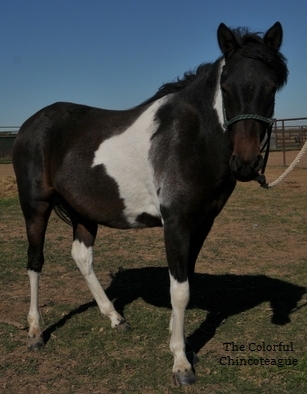 Ponies are either black, chestnut, bay/brown with other colors diluting/modifying the base colors. 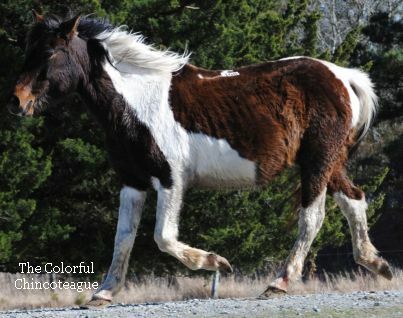 Extension and agouti form the basis of all equine color. Extension determines whether or not a pony has black or not and agouti determines where it will go. Browns have the dominant form of agouti and the dominant form of extension. On browns the black is not as restricted as it is on bays. There was a test for brown, however it was disproved due to inconsistent results. It is now thought that brown is not genetically different from bay. Browns have a black or near black coat with tan on their muzzles, flanks, inner forearms, and inner thighs. Browns can be nearly indistinguishable from dark bay, however they are genetically different. Browns can bleach in the sun. Sunburnt black are sometimes mistaken for bays, however the muzzle of a black will remain black while the muzzle of a brown will remain tan. 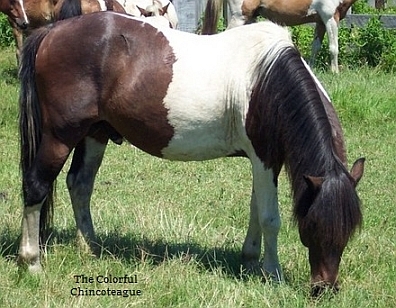 Brown is likely an original color in Chincoteagues as it is widespread and the breed was originally all solid dark colors. A 1891 article in the New York City newspaper The Sun stated that the ponies "are most frequently black, gray, sorrel, or dun [buckskin]." Leonard D. Sale wrote in 1896 in The Horse Review of Chicago that, "The prevailing colors are bay, brown, chestnut and light sorrel. A Washington Post article from 1902 stated that the prevailing colors were bay and black. A 1923 St. Petersburg Times article described the ponies as "bay, gray, dun [buckskin], black, and sorrel". 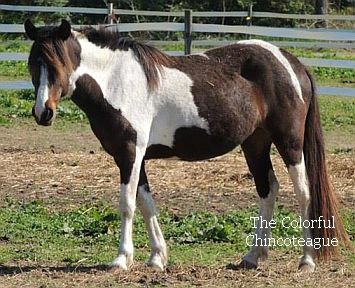 A Delmarva Star article describing the 1930 Pony Penning described the ponies as "many colored", with blacks, browns, bright bays, and so many with spotted coats." Brown tobiano. Surf N Turf, 2014, Picture courtesy of Matt DesJardins. Brown tobiano, sunbleached. Witch Doctor, 2007, Picture by Amanda Geci. Brown tobiano. The Duchess of Lightning, Picture courtesy of Sarah Fung. Brown tobiano. Dreamcatcher, 2014, Picture by Amanda Geci. 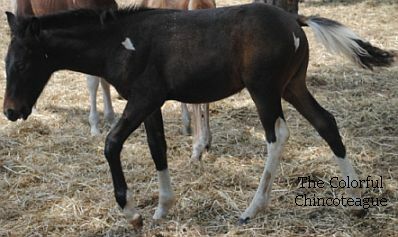 Brown tobiano foal. Sweetheart, 2010, Picture by Amanda Geci. 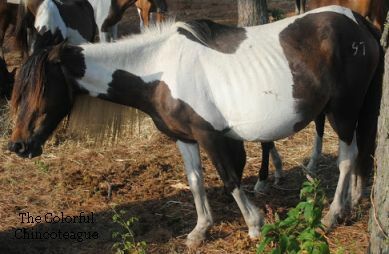 Brown tobiano in winter coat. Seaside, 2015, Picture by Amanda Geci.